Finally after many years of enjoying this hobby, I am taking my first dive into the world of reefkeeping and saltwater aquariums. I've started to build a couple reef tanks in the past but never made it to the point that I was actually ready. Life always seemed to get in the way. I still need some equipment but I'll post what I have and what I plan to have down the road. The plan at this time is to go sumpless and as simple as possible but I will likely add an ATO, skimmer and a doser at some point. I may not use all the equipment posted, I have most of it hanging around from old freshwater setups or prior reef tank builds I started. I welcome any and all advice or suggestions! 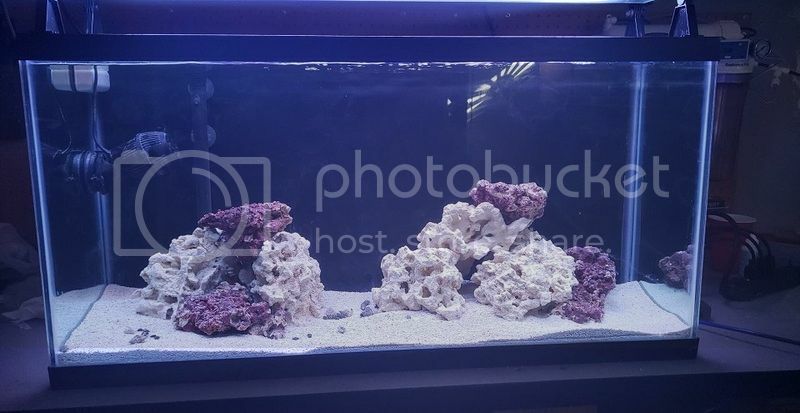 Rocks are a mix of BRS Reef Saver rock and live rock from J&L... they've been cycling in rubbermaids for 2.5 weeks now to try and get as much sand/silt out of them as possible. Keeping an eye on phosphate levels before actually moving them into the tank and adding sand and critters. Last edited by Sidius; 09-21-2018 at 08:16 PM. Not a whole lot to update right now.. I did a full water change in my rubbermaids last night while dunking and swishing the rocks in buckets of saltwater... 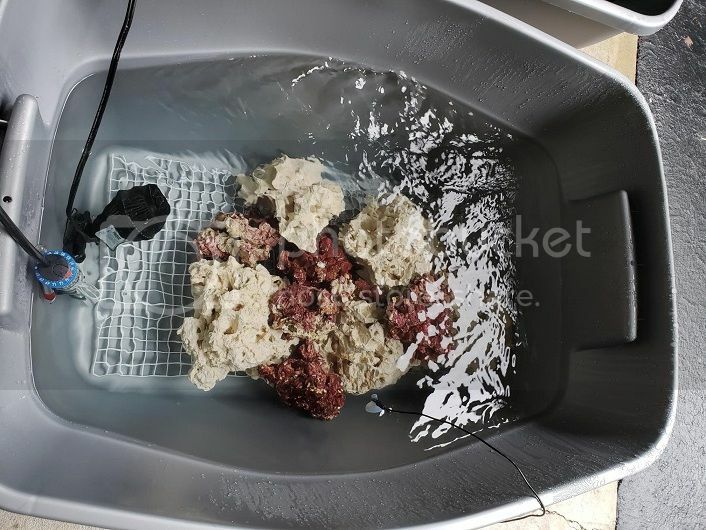 It's surprising how much silt/sand comes out of those new dry/reef saver rocks from BRS when I dunk them.. its so cloudy after that I can't see the powerhead in the bottom of the bucket lol (and this is after a month of curing). I also painted the back of the tank black. I will be picking up some sand tomorrow from J&L and moving the rocks into the tank once I've cleaned the sand a bit. After that, I should be ready for a clean up crew and then maybe my first marine fish! Here's my first attempt at a reef tank aquascape. Please feel free to point out any flaws or issues I might have down the road. I plan to search for an 8 inch long piece of rock to add to the middle as a bridge between the two structures and more surface for corals! I sure remember my first moments with my tank - couldn’t believe there were living creatures inside! I like the scarlet hermits, very well-behaved and hard-working. Awesome start! Before you know it you will be amazed at how much your tank has changed. Ya it's been a lot of fun.. 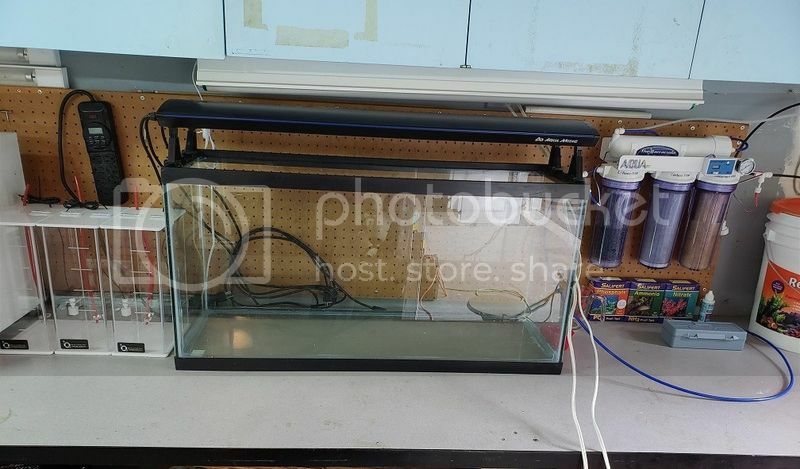 I can't wait to get a fire shrimp and a few fish in there.. I'm waiting a couple months before I try to add any corals. I need proper wavemakers and I want to let things mature. Ya I can't wait to see the changes along the way!! I'm sure a lot of you will laugh at this because you likely thought the same thing the first time you saw it but this morning I woke up and thought one of my Scarlet's had died.. I see a red shell floating around on my sand bed, lifeless and one of my Scarlet's was missing.. 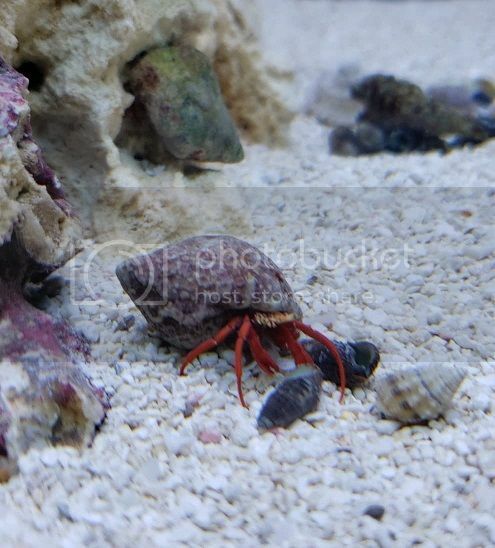 I search all over the tank and see what I thought was his empty shell tucked back behind my rockwork and reach in to grab it, only to see a hermit still living inside.. I guess one of them molted!